It appears this powerful heatwave is about to break. More on that in a moment. Also, today in weather history is when Ben Franklin did the experiment with the kite, key, and lightning. Heat index topped 100° (102°) for the 6th day out of the last nine and for the third consecutive day. Six more high temp records were tied or set yesterday including down in White County at the Sparta water plant where they hit 95°..the old record was 93° from 2008. 154 heat-related temp records have been set or tied in the past 9 days across Tennessee. Finally, our average high temperature for June through the first 9 days is 90.8°, which is the hottest since records have been kept in Cookeville going back to the late 1800's. A hailstorm at Smithville produces golfball-size hail. Seventy cars and 17 homes are damaged. Wind driven hailstones cause holes in the siding of homes. Damage is estimated at $750,000. Lightning strikes a substation on Eddy Lane in Franklin. The lightning damages a breaker, insulators, and lightning arrestors. Eight thousand customers are without power. 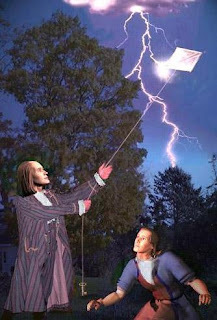 1752 - This is believed to be the date that Ben Franklin did his famous kite experiment during a thunderstorm to determine if lightning and electricity were related. Luckily, he lived to tell of the results. 1957 - A dust devil at North Yarmouth MA lifted a 1000 pound chicken house into the air and carried it 25 feet, depositing it on the ground with only slight damage. 1958 - Stormy weather in El Dorado KS. A woman was sucked through the window of her house and blown sixty feet. She landed beside a broken phonograph record, entitled appropriately: "Stormy Weather." 1988 - Williston ND recorded their seventh record high temperature in eight days with a sizzling 105 degrees. 1995 - The temperature at Yakutat AK soared to 87 degrees for its hottest temperature ever.